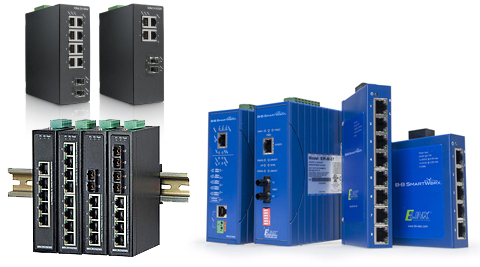 The Industrial Ethernet switches provide a rugged, easy-to-use, highly secure infrastructure for harsh environments. They offer Industrial design and compliance. Network security based on open standards. Ethernet switches come in many shapes and sizes, with many different capabilities. Whether they are managed or unmanaged, they may also include features like multiple ports, heavy industrial specifications, ultra-compact form factors, Power over Ethernet (PoE) gigabit options, and more. The appropriate features will be determined by where the switch fits into the network topography, and what its job will be. “Managed” switches add additional network control and configuration functionality. They can prioritize LAN traffic so that the most important information gets through, which is useful in applications like VOIP. They can be configured to provide an alternate data path if a connection or cable fails. Using Simple Network Management Protocol (SNMP), a network administrator can repair network problems from a central location without needing to physically inspect remote devices.